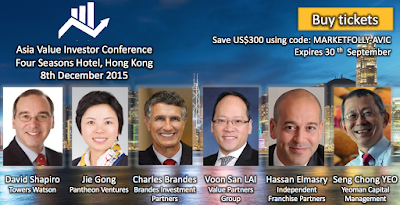 The organizers of the successful London Value Investor Conference will also now be holding the inaugural Asia Value Investor Conference on 8th December 2015 at the Four Seasons Hotel in Hong Kong. Speakers include Charles Brandes, Hassan Elmasry, Voon San Lai, Jie Gong, David Shapiro, Simon Denison-Smith and Mr. YEO Seng Cheong. Tickets are now on sale and the remaining speaker slots will be filled in the next few weeks. Market Folly readers will get a $300 discount to the conference by using the discount code MARKETVOLLY-AVIC when booking. The speakers will provide valuable insights into the methods and approaches that have made them successful, comment on the current investment climate and offer specific investment ideas. Act fast, the discount expires 30th September!